Please call us at (919) 834-6401 if you have any questions. In Christ Patrick L. Wooden, Sr. Please Remember to mention WPJL anytime you contact one of our ministry programs. Tell them you listen over WPJL in Raleigh, North Carolina. 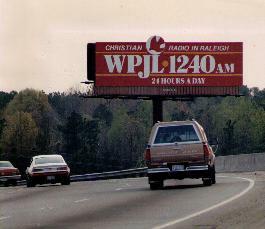 WPJL is the Raleigh Area's First & Foremost Christian Station. Since 1974 WPJL has been bringing the finest in Christian programing to the Greater Raleigh Area. If you would like more information on this station call (919) 834-6401 (or out of the area 1-800-255-WPJL). Contact us for advertising or for rates and available times for ministry programs. WPJL@nc.rr.com or by calling 919-834-6401.